Puri Amanvilas Resale Price increase day by day because of it’s prime location and connectivity. This residential low-rise floors situated at 75 meter wide road & near to FNG (Faridabad-Noida-Ghaziabad) Expressway. Puri Constructions provide luxury Specification & Amenities like AC, Modular Kitchen, Wooden Flooring, Cub Board , Swimming Pool, Open Gym, Basket Ball Court, Kids Swimming Pool, Kids Play Area, Water Body etc. Puri Amanvilas Resale Price Start from 65 Lacs to 75 Lacs depend floors & Sizes. Puri Construction upcoming diwali delivered this project. For More query about Puri Lavender Floors like Price of Puri Lavender Floors, Possession of Puri Lavender Floors, size of Puri Lavender Floors, floor Plan of Puri Lavender Floors, Site Map of Puri Lavender Floors, Location Map of Puri Lavender Floors, Metro Station distance of Puri Lavender Floors and much more. Puri Construtions First time launched gated plots in sector 89, Greater Faridabad. Puri builder provide all types of luxury amenities like swimming pool, basket ball court, tennis ball court, yoga park, kids play area, garden etc. Price of Puri Amanvilas plots start from 34,995/- per sq.yds. with flexible payment plan. Possession of Plots will be delivered in 24 month. Plots are available for private villa / house. For more query about Puri Amanvilas, Possession of Puri Amanvilas, Floors plan of Puri Amanvilas, Site plan of Puri Amanvilas, Location map of Puri Amanvilas, Price of Puri Amanvilas, Plots in Puri Amanvilas, Puri Construction Puri Amanvilas etc. Puri Amanvilas Construction is going in full swing with day night working. More than 70% structure of floors completed and internal work going in full swing. Puri Amanvilas amenities like swimming pool, basket ball court, tennis ball court, yoga park, kids play area, garden 100% complete & open floors owners sunday, you can come & enjoy project amenities. Project will be delivered at the right time august 2020. For more query about Puri Amanvilas, Possession of Puri Amanvilas, Floors plan of Puri Amanvilas, Site plan of Puri Amanvilas, Location map of Puri Amanvilas, Price of Puri Amanvilas, Plots in Puri Amanvilas, Puri Construction Puri Amanvilas etc. Puri Amanvilas luxury floors in olive court is completely sold out and puri constructions preparation for launched new court in puri amanvilas with luxury floors 3 bhk & 4 bhk. After the great successful of puri amanvilas luxury floors in olive court and plots in Jasmine court, puri constructions will be launched new concept floors with luxury amenities & specifications. Location wise puri amanvilas is very good & construction quality is very good so if u are thinking luxury floors in greater faridabad, Puri Amanvilas is one of the best option. Puri Amanvilas one of the best luxury floors in sector 89, Greater Faridabad. This residential project developed by ‘Puri Constructions’. Puri Amanvilas olive court sold out in fresh and only available in resale. Puri constructions will be delivered this project in august 2020. Price of puri amanvilas 3 bhk floors start from 52.95 lacs & 3 Bhk + Servent start from 58.95 lacs depend floor & facing. For more query about Puri Amanvilas, Possession of Puri Amanvilas, Floors plan of Puri Amanvilas, Site plan of Puri Amanvilas, Location map of Puri Amanvilas, Price of Puri Amanvilas, Plots in Puri Amanvilas, Puri Construction Puri Amanvilas etc. Aman Luxury Villas Sec 89 Faridabad is one of the best sector & residential project in Greater Faridabad. Puri amanvilas situated at 75 meter wide sector road & upcoming metro route. Price of floors start from 42.95 lacs to 58.95 lacs depend sizes & type. Residential project will be delivered in August 2020. Puri Constructions first time launched luxury floors with all super luxury facilities. For more query about Puri Amanvilas, Possession of Puri Amanvilas, Floors plan of Puri Amanvilas, Site plan of Puri Amanvilas, Location map of Puri Amanvilas, Price of Puri Amanvilas, Plots in Puri Amanvilas, Puri Construction Puri Amanvilas etc. Puri Constructions new project Aman Villas Faridabad are in great demand because of it’s prime location & Construction quality. Aman Villas in olive court floors at ground floor sold out in all sizes such as 265 sq.yds. 300 sq.yds & 350 sq.yds. & now only in resale. Puri Aman Villas available with only 1st floor & 2nd floor in 1310 sq.ft. & 1440 sq.ft. type 3 bhk + 2 T & 3 Bhk + 3 T. For more query about Puri Amanvilas, Possession of Puri Amanvilas, Floors plan of Puri Amanvilas, Site plan of Puri Amanvilas, Location map of Puri Amanvilas, Price of Puri Amanvilas, Plots in Puri Amanvilas, Puri Construction Puri Amanvilas etc. Puri Amanvilas Lavender Floors have only one types such as 3 Bhk + 2 T with G+2 Floors. Puri Amanvilas Lavender Floors plot size is 260 sq.yds and super built up area is 1080 sq.ft. Puri Amanvilas Lavender Floors have only 36 plots with 108 floors. Price of Puri Amanvilas Lavender Floors start from 36.95 lacs to 48.95 lacs. Puri Amanvilas Lavender Floors at ground floor have lawn area and second floor with 100% roof right. For more query about Puri Amanvilas, Possession of Puri Amanvilas, Floors plan of Puri Amanvilas, Site plan of Puri Amanvilas, Location map of Puri Amanvilas, Price of Puri Amanvilas, Plots in Puri Amanvilas, Puri Construction Puri Amanvilas etc. Puri Aman Vilas is a Luruxy low-rise floors in sector 89, Greater Faridabad (Neharpar) at 75 meter road. Puri Construction launched 100 acres toweship with combination of floors and plots. Puri Aman Vilas Floors have 3 types such as 3 Bhk + 2 T, 3 Bhk + 3 T and 3 Bhk + Servent+3 T. depent super built up area like 1310 sq.ft., 1440 sq.ft. 1500 sq.ft. 1550 sq.ft. and 1670 sq.ft. Price of Puri Aman Vilas start from 52.95 lacs to 58.95 lacs. Possession of Puri Aman Vilas will be delivered august 2020. Puri Aman Vilas is rera approved project. For more query about Puri Amanvilas, Possession of Puri Amanvilas, Floors plan of Puri Amanvilas, Site plan of Puri Amanvilas, Location map of Puri Amanvilas, Price of Puri Amanvilas, Plots in Puri Amanvilas, Puri Construction Puri Amanvilas etc. Puri Amanvilas Emerald Court total no. of plots in this pocket is 54. This Emerald Court also known as Picket D of Puri Amanvilas. Most of plot sizes in this pocket is 300 sq.yds. but also available 265 sq.yds, 350 sq.yds, 400 sq.yds, 500 sq.yds, & 580 sq.yds. Puri Amanvilas Emerald Court located at the corner of kheri road and 75 meter road. Puri Amanvilas Emerald Court of the best location of Puri Amanvilas entire project. For more query about Puri Amanvilas, Possession of Puri Amanvilas, Floors plan of Puri Amanvilas, Site plan of Puri Amanvilas, Location map of Puri Amanvilas, Price of Puri Amanvilas, Plots in Puri Amanvilas, Puri Construction Puri Amanvilas etc. Puri Amanvilas Olive Court is a first pocket of Puri Amanvilas project. Total no. of plots in olive court is 208. with combination of 265 sq.yds, 300 sq.yds, 350 sq.yds, 400 sq.yds, 500 sq.yds and 580 sq.yds. Puri constructions launched Luxury floors and plots in this pocket according to custormer. Floors in olive court available with 4 different sizes such as 1310 sq.ft (3 Bhk + 3T), 1440 sq.ft(3 Bhk + 3T), 1585 sq.ft (3 Bhk + 3T), and 1670 sq.ft(3 Bhk + 3T+Servent). 265 sq.yds – 34955/- per. sq.yds. Puri Amanvilas Floors have 4 different sizes in luxury category such as 1310 sq.ft, 1440 sq.ft, 1550 sq.ft and 1670 sq.ft. Puri Amanvilas 1670 sq.ft. luxury floor built on 300 sq.yds plot with 3 bhk + servent. Price of 1670 sq.ft. start from 58.95 lacs onwards and possession of this project will be delivered in august 2020. Puri Amanvilas one of the best options to live in luxury floors with all luxury amenities and specification. For more query about Puri Amanvilas, Possession of Puri Amanvilas, Floors plan of Puri Amanvilas, Site plan of Puri Amanvilas, Location map of Puri Amanvilas, Price of Puri Amanvilas, Plots in Puri Amanvilas, Puri Construction Puri Amanvilas etc. Aman Villa Faridabad is one of the luxury floors in sector 89, Greater Faridabad. Aman Villa is available with different sizes such as 1310 sq.ft, 1440 sq.ft. 1550 sq.ft. and 1670 sq.ft. Aman Villa are in great demand because of it’s construction quality and location. More than 95% are sold out and number of units are available. Aman Villa provide all luxury amenities and facilites like swimming pool, basket ball court, tennis ball court, yoga park, kids play area, garden etc. Price of Aman Villa start from 52.95 lacs to 58.95 lacs. For more query about Puri Amanvilas, Possession of Puri Amanvilas, Floors plan of Puri Amanvilas, Site plan of Puri Amanvilas, Location map of Puri Amanvilas, Price of Puri Amanvilas, Plots in Puri Amanvilas, Puri Construction Puri Amanvilas etc. Puri Amanvilas Price List is now has been changed and price of puri amanvilas increase day by day because of it’s popularity and construction quality & most of important thing builder because Puri Construction builder delivered every project on time. Now Puri Amanvilas floors price start from 52.95 lacs and 58.95 lacs, gst 12% extra. Plots of Puri Amanvilas hold by puri construction due to FAR( Floor Area Ratio) and announchment on registry of 4th floor by Haryana CM Manohar Lal Khattar. For more query about Puri Amanvilas, Possession of Puri Amanvilas, Floors plan of Puri Amanvilas, Site plan of Puri Amanvilas, Location map of Puri Amanvilas, Price of Puri Amanvilas, Plots in Puri Amanvilas, Puri Construction Puri Amanvilas etc. Puri Amanvilas Possession Time is August 2020. Puri Amanvilas residential low-rise project is located in sector 89, Greater Faridabad. Puri Amanvilas consturtions quality is very good in greater faridabad with all luxury facilities. Price of floors start from 52.95 lacs and price of plot start from 79.48 lacs. For More query about Puri Lavender Floors like Price of Puri Lavender Floors, Possession of Puri Lavender Floors, size of Puri Lavender Floors, floor Plan of Puri Lavender Floors, Site Map of Puri Lavender Floors, Location Map of Puri Lavender Floors, Metro Station distance of Puri Lavender Floors and much more. Plots in Puri Amanvilas is available in different sizes such as 265 sq.yds, 300 sq.yds, 350 sq.yds, 400 sq.yds, 500 sq.yds, 580 sq.yds. Price of Plots in Puri Amanvilas start from 79.48 lacs with include all edc/idc. Possesssion of Puri Amanvilas plots will be delivered in 2 years. Price of Puri Amanvilas day by day increase due to it’s connectivity, location. For more query about Puri Amanvilas, Possession of Puri Amanvilas, Floors plan of Puri Amanvilas, Site plan of Puri Amanvilas, Location map of Puri Amanvilas, Price of Puri Amanvilas, Plots in Puri Amanvilas, Puri Construction Puri Amanvilas etc. Puri Amanvilas ground floors are sold out in fresh. Now Puri amanvilas floors available with 1st floors and 2nd floors in 265 sq.yds and 300 sq.yds. Floors price start in 265 sq.yds floors from 52.95 lacs to 300 sq.yds. floors from 58.95 lacs. Construction of puri amanvilas is going in flow. For more query about Puri Amanvilas, Possession of Puri Amanvilas, Floors plan of Puri Amanvilas, Site plan of Puri Amanvilas, Location map of Puri Amanvilas, Price of Puri Amanvilas, Plots in Puri Amanvilas, Puri Construction Puri Amanvilas etc. Puri Amanvilas Plots sizes start from 265 sq.yds to 580 sq.yds in different – different court. Puri Amanvilas Plots available in all court, in puri amanvilas have 6 different court such as Pinewood Court, Tulip Court, Emerald Court, Jasmine Court, Ivy Court, Olive Court. Puri amanvilas plots sizes are 265 sq.yds, 300 sq.yds, 350 sq.yds, 400 sq.yds, 500 sq.yds, 580 sq.yds. Puri Amanvilas Plots price start from 78 lacs with best payment plan. For more query about Puri Amanvilas, Possession of Puri Amanvilas, Floors plan of Puri Amanvilas, Site plan of Puri Amanvilas, Location map of Puri Amanvilas, Price of Puri Amanvilas, Plots in Puri Amanvilas, Puri Construction Puri Amanvilas etc. 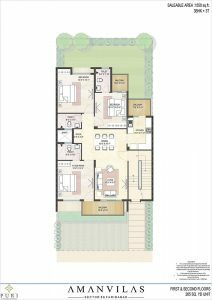 Puri Aman Villas Floor Plan is very good with big room sizes with attached washroom, kitchen, Living Area and with wide balcony. Puri Aman Villas have 4 different floor plan 1310 sq.ft., 1440 sq.ft, 1550 sq.ft. and 1670 sq.ft. Floor Plan of puri aman villas is very attractive and designer. For any question related to floor plan or project call us 9871-092-596. For more query about Puri Amanvilas, Possession of Puri Amanvilas, Floors plan of Puri Amanvilas, Site plan of Puri Amanvilas, Location map of Puri Amanvilas, Price of Puri Amanvilas, Plots in Puri Amanvilas, Puri Construction Puri Amanvilas etc. Puri Amanvilas Possession will be offered by puri construction Decemeber 2020. Construcion on Puri Amanvilas is going very fast more than 25% construction completed at site. Construction quality of this project is very good and more than 80% project sold out, limited units are available. Puri Amanvilas Possession will be delivered at time or before possession time.For more query about Puri Amanvilas, Possession of Puri Amanvilas, Floors plan of Puri Amanvilas, Site plan of Puri Amanvilas, Location map of Puri Amanvilas, Price of Puri Amanvilas, Plots in Puri Amanvilas, Puri Construction Puri Amanvilas etc. Puri Aman Vilas is located at prime location of greater faridabad near to amma hospital and university and commercial hub. Puri Aman Vilas are in great demand because of it’s popularity and it’s construction quality. Puri Aman Vilas floors coming up with luxury facilities like ac, modular kitchens, itilian tiles, branded plumber work etc at best price. Price of Puri Aman Vilas start from 55 lacs only.For more query about Puri Amanvilas, Possession of Puri Amanvilas, Floors plan of Puri Amanvilas, Site plan of Puri Amanvilas, Location map of Puri Amanvilas, Price of Puri Amanvilas, Plots in Puri Amanvilas, Puri Construction Puri Amanvilas etc. Puri Aman Villas Floor Plan is very good with all luxury facilites and aminities. Due to it’s good floor plan with big room sizes and balcony, best design of bathroom & kitchen , living room project near to sold out. For more query about Puri Amanvilas, Possession of Puri Amanvilas, Floors plan of Puri Amanvilas, Site plan of Puri Amanvilas, Location map of Puri Amanvilas, Price of Puri Amanvilas, Plots in Puri Amanvilas, Puri Construction Puri Amanvilas etc. Amanvilas Sector 89 Faridabad located at prime location of greater faridabad (neharpar). Construction start last year on this project and some floor construction come up on 2nd floor. Amanvilas Sector 89 Faridabad now know as puri amanvilas sector because this project is very popular because of it’s location and connectivity and amma hospital.For more query about Puri Amanvilas, Possession of Puri Amanvilas, Floors plan of Puri Amanvilas, Site plan of Puri Amanvilas, Location map of Puri Amanvilas, Price of Puri Amanvilas, Plots in Puri Amanvilas, Puri Construction Puri Amanvilas etc. Aman Villas launched by puri construction in sector 89, greater faridabad (Neharpar). Aman Villas has been lauched by low-rise floors with G+2 concept. Aman Villas sound as vilas but is not villas, it’s available with floors G+2 concent in 100.325 acres. Aman villas is available under-construction property.For more query about Puri Amanvilas, Possession of Puri Amanvilas, Floors plan of Puri Amanvilas, Site plan of Puri Amanvilas, Location map of Puri Amanvilas, Price of Puri Amanvilas, Plots in Puri Amanvilas, Puri Construction Puri Amanvilas etc. Puri Amanvilas one of the best floor society in sector 89, greater faridabad. Puri construction provide best construction quality with all luxury amenities and specification . Puri amanvilas available with two options such as luxury floors with ac, wordropes, wooden works, modular kitchen etc. and classic floors with only wooden works.For more query about Puri Amanvilas, Possession of Puri Amanvilas, Floors plan of Puri Amanvilas, Site plan of Puri Amanvilas, Location map of Puri Amanvilas, Price of Puri Amanvilas, Plots in Puri Amanvilas, Puri Construction Puri Amanvilas etc. Puri Amanvilas Plots Price start from 80 lacs. Puri amanvilas plots are in high demand because of it’s amenities and location. Location of Puri amanvilas plots near to amma hospital, largest hospital in asia with 2500 beds with medical university. Buy plots in Greater faridabad , Puri amanvilas plots one of the best option to purchase plots in this project.For more query about Puri Amanvilas, Possession of Puri Amanvilas, Floors plan of Puri Amanvilas, Site plan of Puri Amanvilas, Location map of Puri Amanvilas, Price of Puri Amanvilas, Plots in Puri Amanvilas, Puri Construction Puri Amanvilas etc. Puri Amanvilas Floor Plan is very good design with big room sizes and other all things like bathroom, dinning hall, kitchen, guest room, servent room, Pooja room , big balcony etc. total overall floor plan of this project is genuinely is very good. Almost very people who look floor plan like this project. Further detail you can call us – 9015-817-168. For more query about Puri Amanvilas, Possession of Puri Amanvilas, Floors plan of Puri Amanvilas, Site plan of Puri Amanvilas, Location map of Puri Amanvilas, Price of Puri Amanvilas, Plots in Puri Amanvilas, Puri Construction Puri Amanvilas etc. Puri Amanvilas Sector 89 Faridabad is also know as “Puri Constuctions” residential project name. Puri Amanvilas located near to Amma Hospital & research centre. Puri Amanvilas is one of the most demandable project in faridabad due to it’s connectivity and construction quality. This project is best option to live and purchase property in Greater Faridabad. For more query about Puri Amanvilas, Possession of Puri Amanvilas, Floors plan of Puri Amanvilas, Site plan of Puri Amanvilas, Location map of Puri Amanvilas, Price of Puri Amanvilas, Plots in Puri Amanvilas, Puri Construction Puri Amanvilas etc. Puri Amanvilas Faridabad is a under construction residential project in sector 89, Greater Faridabad (Neharpar). Puri Amanvilas available with G+2 Concept Floors. This project Situated on 6 lane, 75m sector wide road. Puri Construction provide luxury amenities like Gated Community, 24×7 Security, Lush Greens, Water bodies & Much More. For more query about Puri Amanvilas, Possession of Puri Amanvilas, Floors plan of Puri Amanvilas, Site plan of Puri Amanvilas, Location map of Puri Amanvilas, Price of Puri Amanvilas, Plots in Puri Amanvilas, Puri Construction Puri Amanvilas etc. Aman Villas plots available with multiple choice like 300 sq.yds, 350 sq.yds, 400 sq.yds, and 500 sq.yds. Price of Aman Villas Plots is very genuine in this sector 89, compare to other builder plots. Bptp Group plots and tdi group plots price is very high in this area and sector. Price start from 27,400/- per sq.yds. to 29,400/- per sq.yds.For more query about Puri Amanvilas, Possession of Puri Amanvilas, Floors plan of Puri Amanvilas, Site plan of Puri Amanvilas, Location map of Puri Amanvilas, Price of Puri Amanvilas, Plots in Puri Amanvilas, Puri Construction Puri Amanvilas etc. Puri Aman villas Faridabad is one of the best place to live in Greater Faridabad (Neharpar) with luxury facilities and specification like Ac, complete wooden work, tiles etc. Puri Aman Villas first part of olive court almost sold out. Puri Aman Villas Faridabad price start from with GST 265 sq.yds second floors(61.6 Lacs ) and 265 sq.yds first floors (62.1 Lacs) and 265 sq.yds Ground Floor (69.94 Lacs). For more query about Puri Amanvilas, Possession of Puri Amanvilas, Floors plan of Puri Amanvilas, Site plan of Puri Amanvilas, Location map of Puri Amanvilas, Price of Puri Amanvilas, Plots in Puri Amanvilas, Puri Construction Puri Amanvilas etc. Puri Amanvilas is a new residential Floors & Plots society in sector 89, Greater Faridabad (Neharpar) launched by “Puri Construction”. Puri Amanvilas spreads in 100 acres land at FNG Road (Faridabad-Noida-Gurgaon). Total no. of Plots in this society 474 with G+2 Concept. Types of floors available in puri amanvilas 3 Bhk (265 sq.yds.) and 3+1 Bhk(300 sq.yds.). For more query about Puri Amanvilas, Possession of Puri Amanvilas, Floors plan of Puri Amanvilas, Site plan of Puri Amanvilas, Location map of Puri Amanvilas, Price of Puri Amanvilas, Plots in Puri Amanvilas, Puri Construction Puri Amanvilas etc.